With almost half a million inhabitants, Gothenburg (Göteborg in Swedish) is Sweden's second largest city. It is situated on the west coast and has an important harbour. 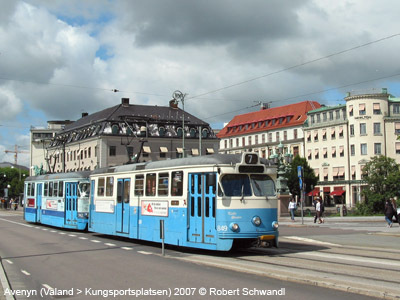 Like many other cities, Gothenburg developed a tram system, originally horse-powered, but later electric. 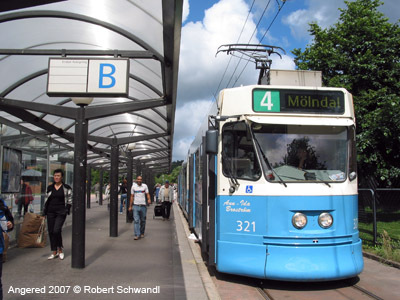 The system was mostly on-street, but already in 1907 some sections were built on their own right-of-way, to Mölndal and Saltholmen. 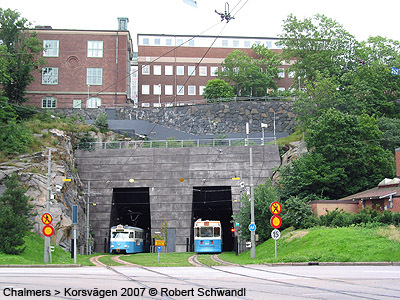 The Långedrag line to Saltholmen was actually a railway, but it did never see other traffic than trams. On the other hand did the extension from Linnéplatsen to Marklandsgatan share tracks with the Särö railway for four years (1962-1966), after which the railway was closed. 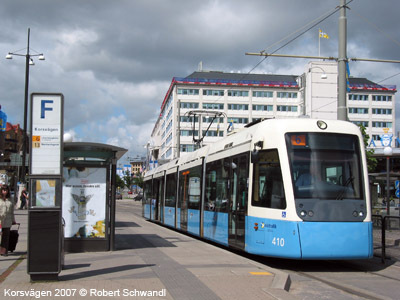 In the 1950's and 1960's, Gothenburg had plans to convert the tram network into a light rail system similar to the Stadtbahn systems in Germany. Between 1951 and 1989 all extensions to the network were built on their own right-of-way, without level crossings. The only exceptions were two re-routings of existing lines. 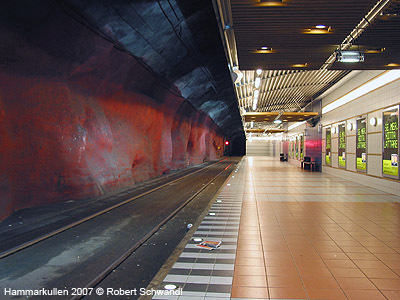 The most Stadtbahn-like section of the network is the Angered line, which was built with longer station distances, island platforms and prepared for high platforms. The Angered line wasn't even connected to the rest of the network for the first years of its existence; it also ran on a higher voltage. There were also plans for further extensions to Gårdsten, Rannebergen and beyond, but they did never materialise. 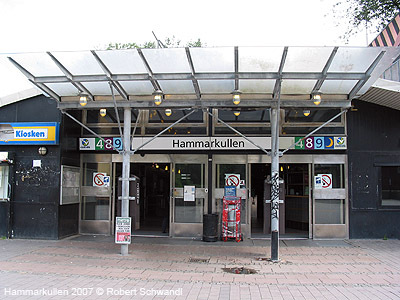 Besides the Angered line, also the lines Bergsjön, Länsmansgården, Tynnered and Guldheden are almost completely segregated, though at stops pedestrian crossings exist to reach the opposite platform (see map below). 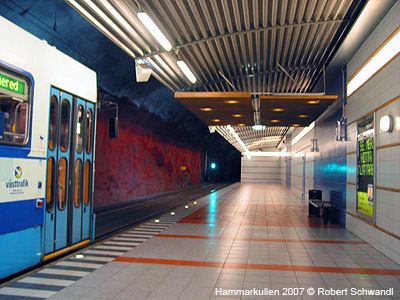 There are some elevated stations on the line to Länsmansgården. 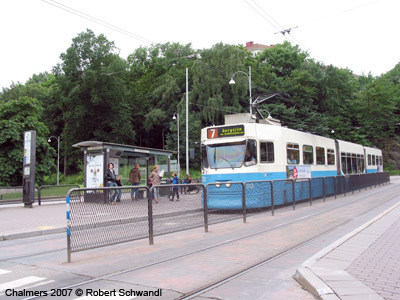 Before the class M21 LRVs were delivered in the 1970's, the future did not seem very bright for Gothenburg's trams. 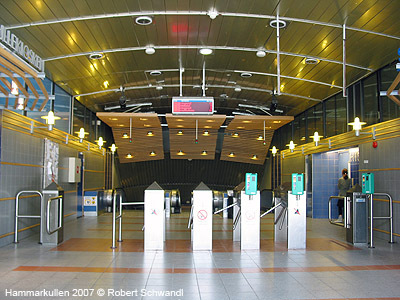 The plans for two cross-city tunnels to connect the outer light rail sections were shelved. 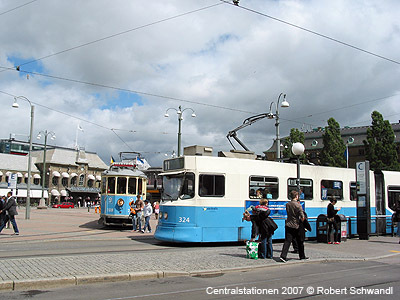 It was even possible that the M21's would become the last trams in Gothenburg, to be replaced by buses. However, with the 1990's came a new interest in the network. A number of on-street extensions have been built in the city centre, and class M21 has been converted to M31, with a low-floor middle section. New AnsaldoBreda Sirio LRVs are also being acquired, called class M32. 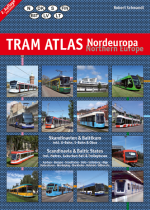 Today's system is a mixture of traditional street tram operation, though hardly any section is share with motorised traffic, and light rail sections, with all lines running on both types of track. The lines have been changed many times, though lines 1-5 can be traced back to the original electric network from 1902. 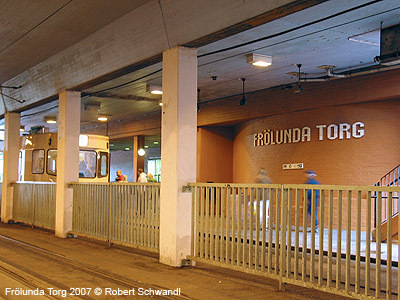 The network has a total length of 118 km with 132 stops, of which 2 are underground (Frölunda Torg and Hammarkullen). Future plans call for new lines along the river shores, but they will probably be on-street or with level crossings. 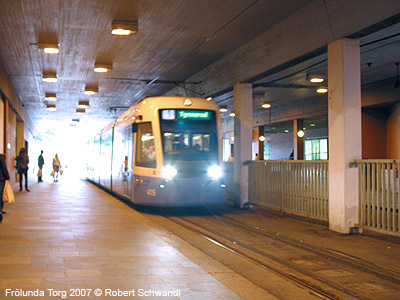 Later the abandoned light rail line between Eketrägatan and Londongatan, Gothenburg's only major closure, might be reinstated. 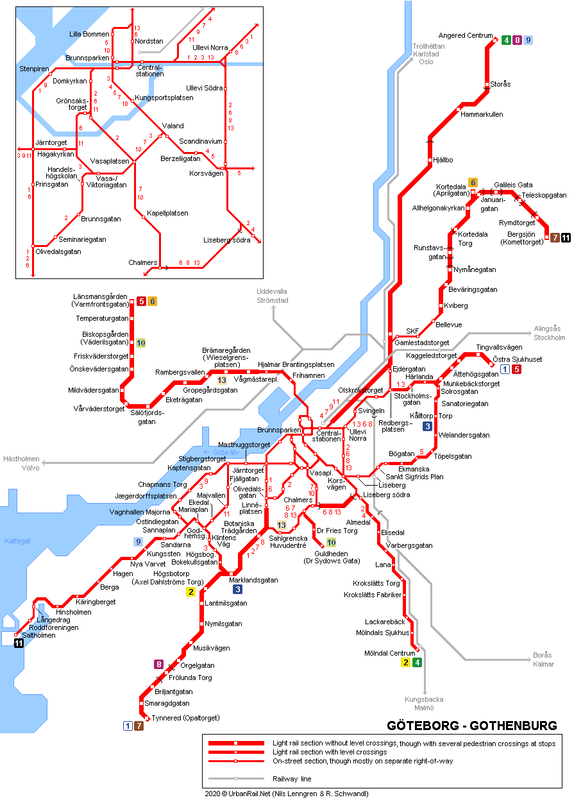 Light rail extensions from Hjalmar Brantingsplatsen to Backa and Kärra, from Östra Sjukhuset to Vallhamra torg and a new cross-river connection are also further in the future. This page was made possible thanks to Nils Lenngren!